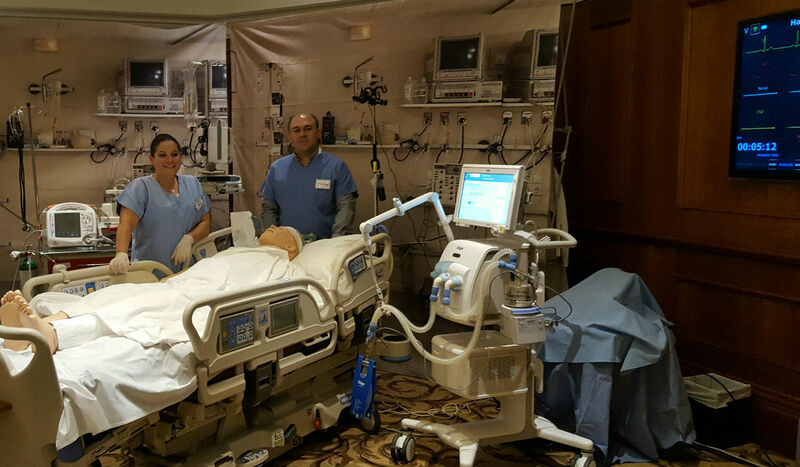 A mobile simulation unit was achieved on October 2016 at Phoenicia Hotel during the 12th International PanArab Critical Care Medicine Society Conference 2016. Participants were anesthesiologists, emergency room physicians, intensive care physicians, nurse anesthetists, anesthesiologist assistants, residents of various training programs, fellows, and respiratory therapists, who wish to improve their knowledge, competence, and performance in advanced airway management. Faculty who managed the simulation were: Dr. Ralf Krage (The Netherlands), Dr. Vanda Abi Raad (LAU), Dr. Carine Zeeni (AUB), Dr. Hanane Barakat (LAU), and Dr. Nabil Mansour (St Georges Hospital). The program started with an introduction followed by a lecture on difficult airway identification and algorithm + Q&A, skills stations, simulation scenarios, a lecture on non-technical skills in airway management, and ended by a wrap up and evaluation of the workshop. Airway management is the cornerstone of safe and effective intensive care. Simulation based education offers to participants the opportunity to practice managing airway emergencies using full patient simulation and real clinical teams in a simulated room mimicking an ICU space. It also increase participants’ non-technical skills and improve their ability to manage airway emergencies efficiently and effectively.